"My smallest loves pancakes but I hated to constantly make him those enriched flour and unhealthy pancakes. 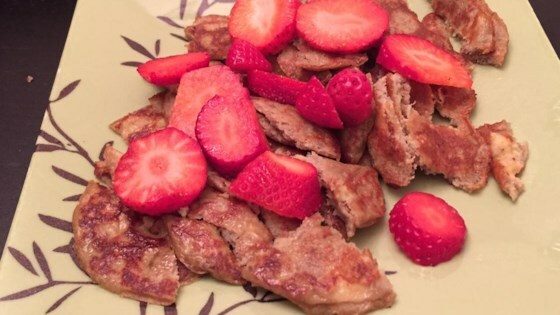 So as I entered my journey into paleo I discovered these absolutely heavenly pancakes and have modified the recipe to make them even more perfect. Now I don't have to feel like a bad mom when I make him his favorite almost everyday." Heat 1 teaspoon coconut oil on a griddle set to 325 degrees F (165 degrees C) or a skillet over medium heat. Place bananas in the bowl of a stand mixer. Add eggs, 3 tablespoons coconut oil, vanilla extract, salt, and baking soda; beat until batter is smooth and fluffy. Gently ladle batter, about 1/4 cup per pancake, onto the hot griddle; sprinkle with cinnamon and arrange walnuts on each pancake. Cook until bubbles form and the edges are dry, 3 to 4 minutes. Flip and cook until browned on the other side, 3 to 4 more minutes. Repeat with remaining batter, adding more coconut oil between batches. I prefer to use all organic ingredients and I would recommend you give it a try. It makes a huge difference in taste and your health. Don't be afraid to modify by using different spices or nuts. Try also blueberries. You can also mix batter in a blender or food processor. Taste was ok, but they were really thin. More like crepes. I would fill with ricotta and fruit next time and roll them up! Delicious!! Makes a lot of pancakes! As others mentioned, cook slower at a lower temperature. Great recipe! The taste is really good. My husband is a diabetic and pancakes made with flour and sugar is not something he can eat. Great alternative. I really liked this recipe! They are easier to flip if they are small :) thanks for sharing!